Clem, my sweet and incorrigible Jack Russell Terrier, woke up at 4:00 AM on Monday with large, marble-sized lumps ALL OVER HER BODY. She looked pitiful and quite awful. The vet didn't open until 8:00, so I gave her a doggie dose of Benadryl and said a quick prayer. Once we got to the vet's office, he gave her a liquid dose of Benadryl and a low dose of some steroids. After an hour, it looked like her lumps had gone away. They creeped back a little at night time and I worried some more, but they eventually calmed down with regular doses of Benadryl. All seems well now and I'm chalking it up to some kind of environmental encounter outside -- bugs? Lawn treatments? Who knows. Hopefully her skin calms down and she (me too!) gets some peace. Has your pet ever had some crazy reaction to something? Did you figure out what it was? Needless to say, I haven't had a ton of time to bake new things. 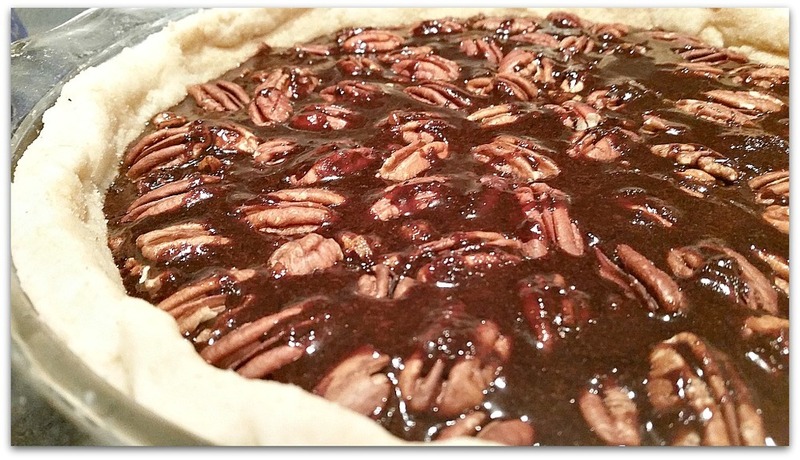 Instead, I went back to an oldie-but-goodie: Chocolate Bourbon Pecan Pie! I made it on Tuesday afternoon and it turned out very well. This recipe is deelish and will turn out great on your first try! It's not as sweet as traditional pecan pie, but let me give you some pointers on the recipe, to make it better! Of course, I use my easy 4 Ingredient Crust recipe. Lately, I've been freezing half (vegan) butter and half organic shortening to make it. I think that it turns out better than just with the shortening alone. Make sure you freeze the butter/shortening for at least 30 minutes before making the crust, along with the vodka or water. You want everything really cold. Because of my dog lump saga, I really rushed this process and you can see that in the finished crust product. It's a little wonky, but it tastes good and worked well. First, my original recipe calls for coconut sugar. It's a very subtle flavor, so if you'd like a stronger hint of sweetness, I suggest using brown sugar. It will easily sweeten the pie in a subtle way. Next, the recipe calls for both pure maple syrup and molasses. If you don't like molasses, just substitute more maple syrup. I will say that the molasses gives it a more fall-like and holiday-like feel. If you want the pie to taste closer to a traditional pecan pie, I suggest that you use all maple syrup and all brown sugar. This swap changes the flavor profile of the pie in a good way. The recipe also calls for two or three tablespoons of bourbon; I used vanilla-infused bourbon. You really can't go wrong there. I know, I know -- pecans are expensive! What I suggest: If you don't care about visuals, use two cups of pecan pieces; they are cheaper. If you do care about arranging the pecan halves, use 1 1/2 cups of pieces and a 1/2 cup of pecan halves. Fill the pie with the pieces and layer the halves on top. (Reserve a little of the filling to drizzle over the pecan halves on top. This makes the pie look stunning! I hope you enjoy making this pie during the holiday season -- it's a good choice and surprisingly easy to make!